All along I thought baking breads and buns are a daunting task because it involves the usage of yeast. I don't have a breadmaker thus making it more daunting because you have to knead it right to ensure you get a fluffy and soft texture. 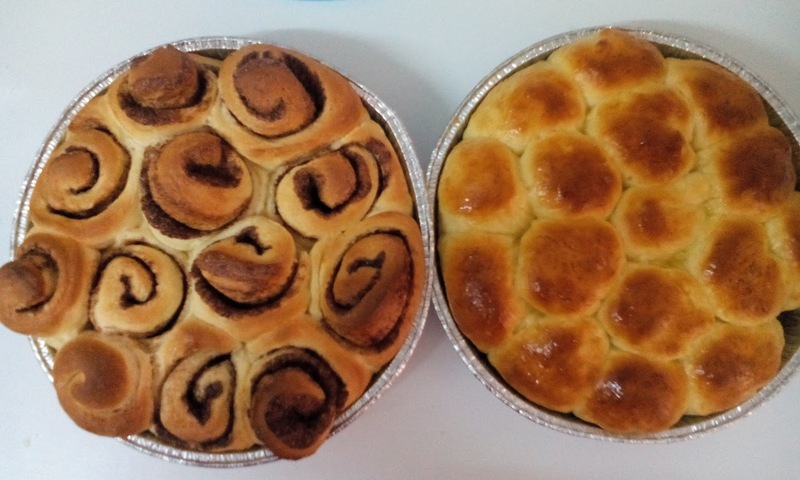 However, I was always tempted to make my own buns and cinnamon rolls after reading so many recipes and they seem to be quite easy after all. I normally get recipes from the internet and followed them step by step. 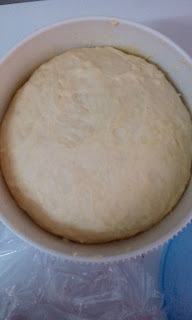 This is the dough after it was rested for about 30 minutes. Initially it was about half the size of that but after resting, the dough almost doubled in size, which is exactly what I wanted. The recipe that I used yielded quite a huge dough so I decided to halve the dough. 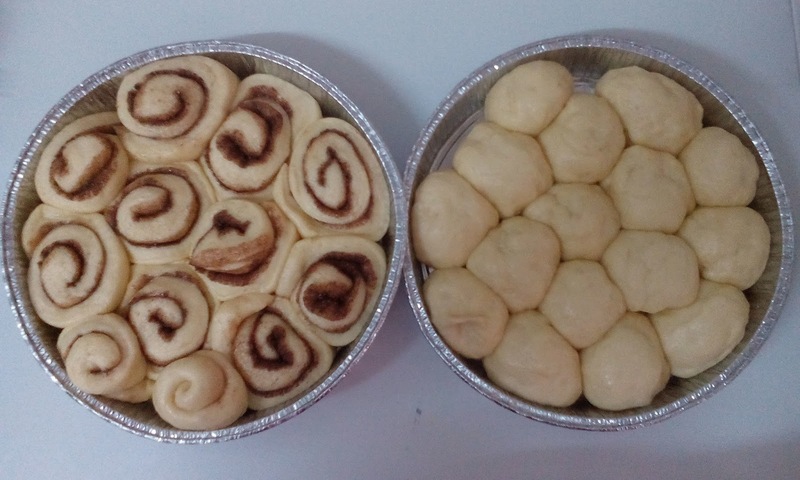 One half is used to make cinnamon rolls. 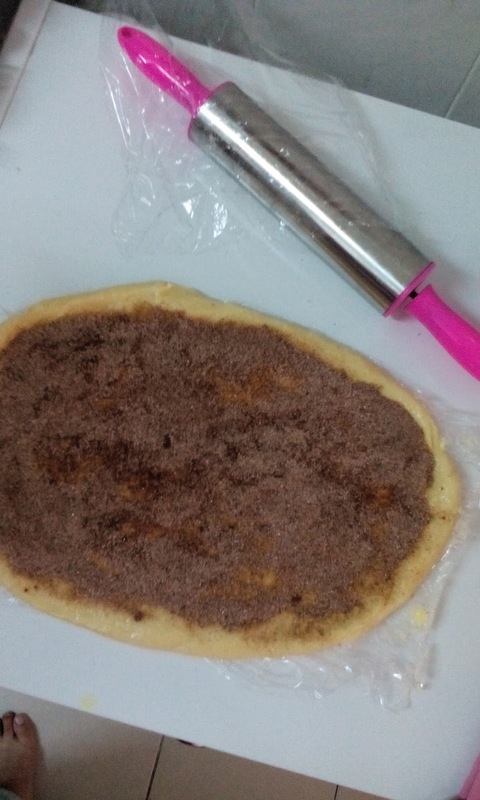 I simply rolled out the dough, spread some butter and sprinkled a sugar and cinnamon mixture onto the dough. I then rolled them tightly and cut them into pieces. The other half of the dough was made into golf-size balls. I placed the cinnamon rolls and the buns into disposable baking tins which I have lying around in the pantry. I greased the tins with some cooking spray. After that, the buns and rolls were left to rest for another 30-45 minutes for them to rise again. See that there are gaps in between the rolls and the buns? This was after they were rested for the second time. They have expanded and filled the gaps in between. Before I baked the buns, I applied some egg wash (egg+water) onto them so that they have the golden colour when baked. This was after they were out from the oven. I must have left my cinnamon rolls in the oven a bit too long that they were a bit too brown. I should have added a bit more of the cinnamon and sugar mixture the next time so that I can get that gooey filling like Cinnabon's. I made a cream cheese frosting for the cinnamon rolls but I did not take a picture of them. AS for the buns, I brushed some butter onto the buns while they're still hot so the butter melted nicely and left a shiny glaze. Since I am not a professional baker, everything and everytime I bake something is a trial and error. The recipes on the internet may be good, while some may not turn out that nice, though it may be because I did something wrong along the way. 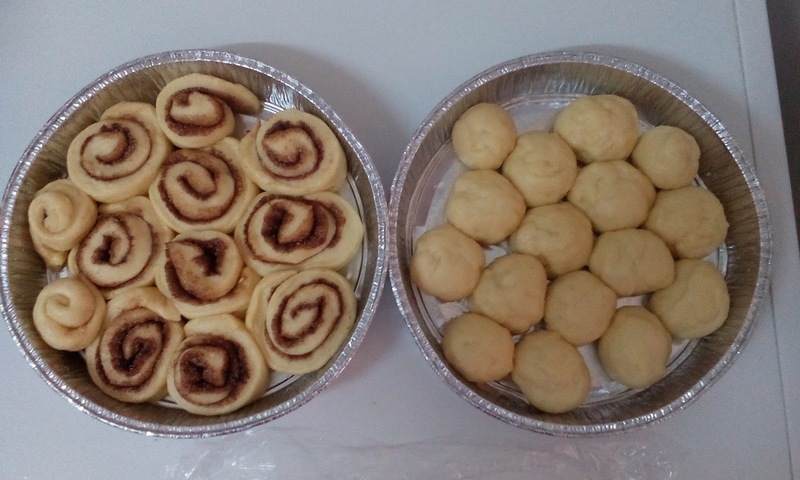 As for this time, I must make the rolls tighter for the cinnamon rolls, add more sugar and cinnamon and bake them until they're golden brown. I must also space out the cinnamon rolls and buns next time so that they can expand and bake nicely. They were a bit dense to my liking, not really soft and fluffy that I was hoping for. Oh well, better luck next time! I recently bought a packet of High Protein Flour so I shall try baking buns with them and see if there's any difference than using an all-purpose flour. Time To Revive This Blog!